Preheat oven to 375. Bake potatoes one hour or until fully cooked. Half each potato and scoop out the insides into a bowl. Place the empty skins openside up on a foil-lined baking sheet. Meanwhile, steam the broccoli. Drain and set aside. Add the broccoli to the bowl with the potatoes. Using a potato masher or large spoon, mix the potatoes and broccoli together until the broccoli is evenly distributed in the potato. Add the 2/3 cup shredded Gouda, butter, sour cream, spices and green onions and stir until well mixed. Scoop the mixture into the skins, sprinkle with additional Gouda. Bake 10-15 minutes or until the cheese is browned and the potatoes are hot. Serve immediately. Some of you might have noticed that I have started another blog devoted to one of my favorite food stores, Aldi. I started shopping there about a year ago and have saved so much money! Most of my home life revolves around cooking and food is a major part of our social life too. Shopping at Aldi really cut our grocery bill (I spend less than $70 each week on groceries now) leaving more money for food festivals, dining out and indulging in specialty ingredients. I came up with the idea for the new blog after making these twice-baked potatoes and realizing that I made them using 100% ingredients I bought at Aldi. So I started my Aldi fan site Attention Aldi Shoppers. There I share recipes, shopping tips, Aldi finds, and product reviews. If you have an Aldi near you, check it out! As for these potatoes, they were so good! You could serve them as a vegetarian entree or as a side. 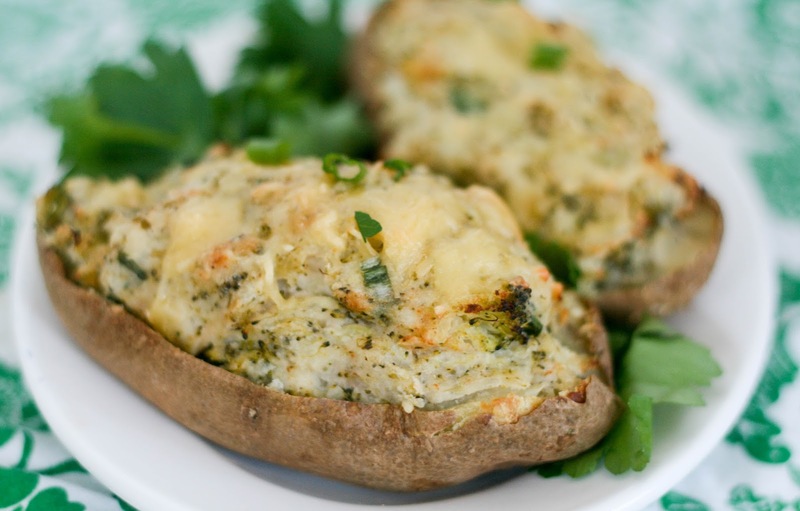 They were super easy to make if a little time consuming because of the hour it takes you to bake a potato but they came together quickly and had a ton of flavor thanks to the gouda-broccoli combination.